Should the European Neighbourhood Policy stop at the borders of the European Union’s immediate neighbouring countries? This book is the first full length study of the ’neighbours of the EU’s neighbours’, a concept originally introduced by the European Commission with reference to Saharan Africa, the Middle East and Central Asia. These regions in the EU’s broader neighbourhood are often perceived as an ’arc of crisis’ from which manifold challenges emanate for Europe. 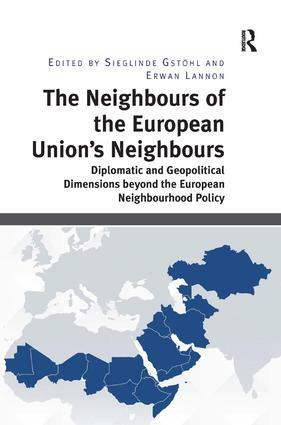 This timely book takes stock of the state of the EU’s cooperation with the neighbours of its neighbours and explores how the concept might help promote security, stability and prosperity beyond the countries which are formally part of the European Neighbourhood Policy. How can the EU create bridges between these regions? What instruments does the EU have at its disposal and how can it link them in order to respond to the challenges and overcome the current fragmentation? One of the conclusions is the suggestion to consider a pragmatic ’EU Strategy for the Neighbours of its Neighbours’ which addresses the needs of the broader EU neighbourhood in a more systematic and consistent manner and helps transform in the long run the ’arc of crisis’ into another ’ring of friends’. Sieglinde GstÃ¶hl is Director of Studies and Professor at the College of Europe in Bruges. Professor GstÃ¶hl holds a Ph.D. in political science as well as an MA in International Relations from the Graduate Institute of International and Development Studies in Geneva, Switzerland, and an MA in Public Affairs from the University Of St. Gallen Switzerland. Her fields of interests are EU external relations, in particular EU trade policy and external representation, theories of regional integration and of international relations, global governance, international political economy, diplomatic training, and small states. Erwan Lannon is Professor in the EU International Relations and Diplomacy Studies Department in Bruges and Visiting Professor in the European Interdisciplinary Studies Department in Natolin. He is also Professor in European Law at the Faculty of Law of the Ghent University.Erwan holds a Master’s degree in International Politics and Strategic Studies from the Université Libre de Bruxelles, and a Ph.D. in European Law from the Université de Rennes I. He has worked as Researcher at Ghent University and then as an expert for several EU institutions, the EU Institute for Security Studies, Euromed networks and as consultant for the United Nations (UNDP) and the European International Movement.